The aim of the Winter Service Plan 2018-2019 (PDF) - 4,111 kbs is to set out how Sligo County Council will deal with ice and snow conditions on roads in County Sligo. The winter service plan will be amended as necessary during the winter season. The National Roads Authority (NRA) published a National Winter Service Manual in 2010 which is in working draft format. The purpose of this is to identify the processes, procedures and key personnel employed by Sligo County Council to deliver the winter service for County Sligo. In general planned treatment responses involve spreading salt on the road during frost and snow ploughing during snow periods. Winter service is not an emergency service in the traditional sense in that low temperatures, ice and snow are regular, frequent and reasonably predictable occurrences. This plan does not deal with other extreme winter weather events such as flooding and high winds. The Council’s objective is to provide an effective and efficient winter maintenance service within the resources available and to minimise the impact of frost, ice or snow on the travelling public. The aim of this winter service plan is to set out how Sligo County Council will deal with ice and snow conditions on roads in County Sligo. The winter service plan will be amended as necessary during the winter season. The purpose of this Plan is to identify the processes, procedures and key personnel employed by Sligo County Council to deliver the winter service for County Sligo. In general planned treatment responses involve spreading salt on the road during frost and ploughing snow during snow periods. The Council’s objective is to provide an effective and efficient winter service within the resources available to minimise the negative impacts of frost, ice or snow on the travelling public, i.e. The level of service will vary with the priority assigned to particular routes e.g. Priority 1 roads will be given a higher priority than priority 2 roads etc. Most of the roads serving the above locations are listed as Priority 1 and Priority 2 routes. Given the scale of the resources involved in delivering the winter service, it is not possible to provide the service to all parts of the roads network. Sligo County Council salt approximately 15.5% of the road network. It is not possible to ensure that road surfaces are kept free of ice or snow at all times on the treated parts of the network. Motorists should drive with due care and attention at all times, particularly during ice/snow periods, and not assume that if a road is on a salting route that it is free of ice and snow. It takes a time to mobilise the plant and to complete salting a route. A road may have been salted and if rain falls shortly afterwards, some of the salt may be washed off the road surface and the road could get icy again soon after salting. Non-salted roads are even more hazardous during ice/snow spells. Winter maintenance on national roads is carried out by Sligo County Council for the TII and is funded by the TII. Winter maintenance on Non National Roads is funded by the Department of Transport, Tourism and Sport and Sligo County Council. The winter maintenance season is from Monday 15th October, 2018 to Sunday 28th April 2019. All of the above is subject to the availability of resources. Resources include finance, salt, plant and labour. The winter servicing of the road network in Sligo is prioritised considering the strategic importance of the roads, the volume of traffic on the roads and roads that are important to the region. The TII Winter Service Working Draft Manual suggests the following criteria for the prioritising of routes. Those routes which are essential to be kept serviceable in all weather conditions, as far as reasonably practicable. 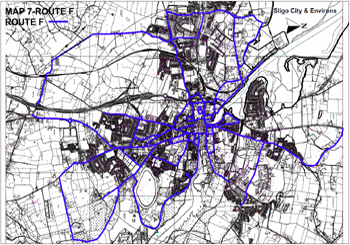 Those routes which are desirable to be kept serviceable in the normal winter weather conditions, as far as reasonably practicable. 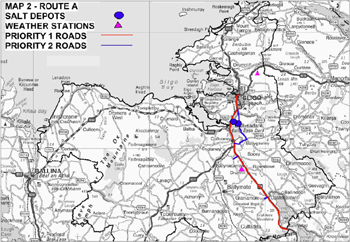 Priority 2 routes could include those routes which are important regionally, such as (for example) principle public transport routes, or the main commuter routes. To be treated as part of the normal winter service but may have interruptions to treatment in certain severe weather events. Priority 3 Those routes that could be kept serviceable once Priority 1 and 2 routes have been treated, if resources allow. 1 N4, N15, N16, N17, N59. Regional Roads – R277, R278, R279 Cliffoney – Mullaghmore, R284, R286, R287, R290, R291, R292, R293, R294, R295, R296, R297, R298, *R361, Collooney – Coolaney – Rockfield road, The Regional and some Urban roads in Sligo City / Environs (shown on Treatment Routes “B”, “E” and “F”). L-14019 – to HSE Centre at Cloonamahon, L-7428-0 (Loop road to St. Angela’s College, Clogherevagh), L-1404-0 - N4 Castlebaldwin to Cloghoge N.S. 3 Roads not listed on Priority 1 or 2 but have steep gradients in housing estates, junctions with National roads. Table 3 shows the principal roads along each salting route. 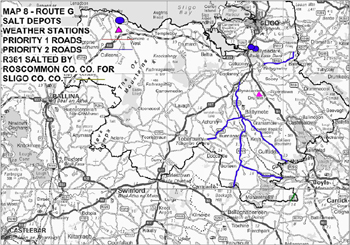 Sligo County Council have 7 salting routes (Routes A, B, C, D, E, F and G). Refer to maps in Appendix A for locations. 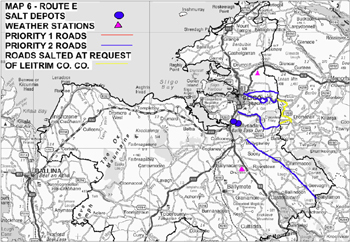 A N4 (and Slip Roads along Dual Carriageway), R284 Ballygawley – Carrowroe, R290 Collooney – Ballygawley, L-14019 to HSE Centre at Cloonamahon,, L-14043 N4 Castlebaldwin to Cloghoge N.S. B N15, N16, R277 in Strandhill and road to the Promenade in Strandhill, R279 Cliffoney – Mullaghmore, R291, R292. C N17 (Toberbride – Tubbercurry – Bellaghy), R294 Gorteen – Tubbercurry - Border with Mayo, L-4501-0 N17 – junction with R294 at Ballyara), Tubbercurry Town Centre Streets, Collooney – Coolaney – Rockfield Roads, R290 Collooney – Ballysadare Bridge, N59 Ballysadare Bridge - Old N4 – Carrowroe Roundabout. N59 Ballysadare Bridge – Mayo Border, R297 Mayo Border – Enniscrone – Easkey – Dromore West, R298 from junction with N59 to junction with R297. * It is proposed to salt the sections of R286, R287 and R288 circuit around Lough Gill via Dromahair in Leitrim on this route also (as requested by Leitrim County Council). F Sligo City and Environs including , Molloway Hill – Connaughton Road – Thomas Street – Castle Street – O’Connell Street – Markievicz Road – The Slip – Pearse Road to Carrowroe Roundabout, Mail Coach Road – Adelaide Street-Lord Edward Street – Sligo City Streets and roads in Sligo Environs. 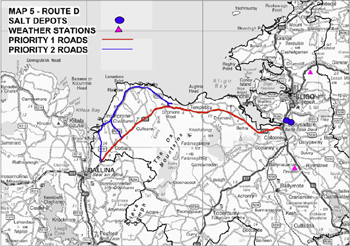 R293 / N17 Junction (Clarkes Bridge) – Roscommon Border, R294 Roscommon Border – Gorteen, R295 Ballymote – Roscommon Border, R296 Junction with R294 – Bunnanadden – Ballymote. The streets of Ballymote, R290 Ballygawley – Ballintogher – Junction with R287. Note: The section of R361 in County Sligo will be salted by Roscommon County Council when they are salting their section of R361. Table 4 sets out the maximum mobilisation and treatment times for the routes. Precautionary treatment is when salt is spread following warnings of expected low temperatures to reduce the likelihood of ice forming on the road. Sligo City Centre footpaths will not be considered for treatment except in severe or prolonged winter weather and then only when resources are available. During extreme cold periods and during snow the Machinery Yard staff will be helped by the Roads Area staff. Plant and additional hired mechanical spreaders/drivers will also be used for getting grit and salt onto the roads particularly on hilly local roads, roads near schools and roads where traffic is encountering problems due to the weather. 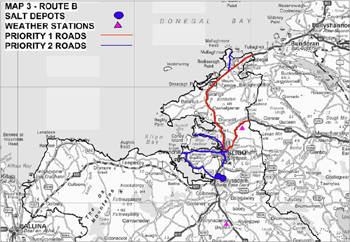 The Road Network in Sligo is approximately 2,840km long. 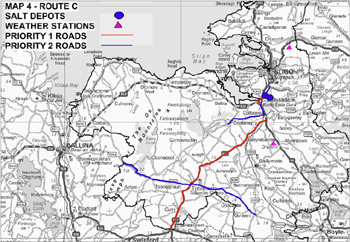 Sligo County Council ordinarily treats 440km approximately of road which equates to 100% of the National Primary network, 100% of the National Secondary network, 100% of Regional roads and 48km approximately of the local/urban road network. The percentage of the Roads Network salted is 15.5% approximately. The TII procures bureau weather services to assist Sligo County Council and the other Local Authorities in predicting when frost, ice or snow may occur on the road network. These services are currently provided by a combination of Met Éireann and Vaisala. The weather forecast information (supplied by Met Éireann) and the weather station measurements (from Vaisala) are available to the On Call Duty Engineer. There is one weather station in County Sligo. It is located at Drumfin south of Collooney on the N4 and described as the “N4 Collooney Bypass” Weather Station. TII are planning to relocate the N16 Manorhamilton weather station from Gortnagrelly to a location closer to Manorhamilton in County Leitrim. (Old station was damaged by a car which slid off the road). Duty Engineers have also access to other weather station information in neighbouring counties e.g. in Mayo on N59 between Ballina and Crossmolina, on N5 near Charlestown, on N61 near Elphin and at Tullaghan on N15. The Duty Engineer will review the weather forecast information each day. Based on the forecasts the Duty Engineer will make and record the treatment decisions for the evening and the following morning. The Duty Engineer will continue to monitor weather as necessary, particularly when the forecast is marginal. This may change the previously planned decision depending on weather trends. Precautionary evening treatments will generally commence after 7.00pm. However, this time may change dependant on weather conditions. If it was raining, treatment would not commence until the rain stops. The Duty Engineer on reaching a decision about salting will inform the Technical Services Supervisor, Machinery Yard and give details of the routes to be salted, the spread rate of salt and the proposed starting times. The Technical Services Supervisor, Machinery Yard will in turn notify/call out the Machinery Yard drivers rostered to salt the routes and give them the salting details. Sligo County Council operates 7 Salting Routes. 5 No. 6m3, 1 No. 9m3 and 1 No. 5m3 salt spreaders are normally used. The salt spreaders are all Romaquip demountable type - mounted on trucks. The loading shovel for loading the salt is hired and the Technical Services Supervisor, Machinery Yard ensures that it is available prior to the start of the season and that it is always available at short notice. The Technical Services Supervisor, Machinery yard will also ensure that suitable backup loading plant is available at short notice in case of a breakdown. All plant is fully serviced prior to the start of the season. Plant shall be checked for all safety features at the end of each treatment run in preparation for the next run. The TII has procured salt for the 2018/2019 season and operates the Salt Management System. Sligo County Council arranges to collect the salt from the TII depots. Rock salt is the most commonly used de-icing material. Marine salt is also readily available and is also suitable. Rock salt should comply with BS 3247:1991 ‘Salt for spreading – Coarse Rock Salt’. Table 5 shows the approximate salt used on each route spreading at 10g/m2, 20g/m2 and 40g/m2. Duty Engineers will return details of depot salt stock, salt usage and salt received to the NRA weekly (or as requested). The Machinery Yard in Drumaskibbole. This was constructed in 2009. It is located adjacent to the N4 Dual Carriageway and is very convenient for access to all routes. Union Quarry, Ballysadare along R284. Welfare facilities are available for staff at the Machinery Yard and at Union Quarry. Details of the Sligo County Council salt depots are shown in Table 6. The roofed salt barns at Drumaskibbole and Union Quarry are filled at the beginning of the season and again prior to the Christmas shutdown if salt is available. As salt is removed from stockpiles a safe slope on the salt must be maintained to protect operatives from the risk of collapse of the stockpiles. Servicing of Plant i.e. lorries, salt spreaders and snow ploughs. Ordering of Salt through TII Salt Management System. Preparation of depots including checking lighting. Check weather station operation and website access. Check snowploughs and test attachments to trucks. Check stock of salt spreader spare parts. The communication of road conditions especially during severe cold/snow spells to the public is very important. Sligo County Council will use the broadcast and print media and its own website to inform the public about road conditions and the Council’s Winter Service Plan. 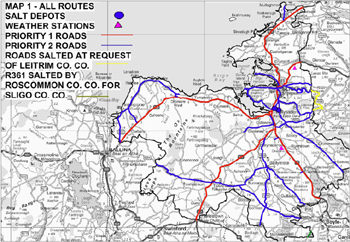 The salting route maps are posted on the Sligo County Council website for the duration of the winter season including summary information from the service plan. During severe or prolonged cold weather the Council website will contain frequently updated information on road conditions in the County. Updates and progress reports will be issued on a regular basis to the local radio stations and newspapers about the road conditions. Sligo County Council advertises emergency contact telephone numbers to deal with out of office time enquiries. The distribution list includes the people named in the plan.